Over the last three years, we have been witness to a great increase in the power and reach of the state. Recent decisions of your government ( outlined in Part one of this letter ) are a dangerous display of the encroachment of state powers into the private economic domain. The right to privacy or government regulation of personal choice. Policy decisions have the potential to impact millions of people, and so they should be grounded in logic, evidence, good economics, and common sense. Economics is a subject haunted by many fallacies, 90% of which can be avoided by following this one lesson from a must-read book Economics in One Lesson by Henry Hazlitt. Ignoring secondary effects and long-term consequences are the most common sources of error in public policy. Take the decision to demonetize. You ignored the secondary effects of demonetization on economic growth. You never foresaw how sucking away poor people’s capital–cash–would potentially shut down hundreds of small businesses and destroy livelihoods. India’s economic growth took a huge hit because of the unintended consequences of demonetization, the long term effects of which will be felt for years by the millions who live under conditions of extreme precarity. Bad policy confines itself only to the effects that are visible. Good policy making, on the other hand, requires taking into account both the effects that can be seen and also the opportunity costs as well as the unintended consequences that affect economic activity in ways that are “unseen” or ignored. Every policy maker must, therefore, be able to understand the difference between what is seen versus that which is unseen. Your decision to waive farmer loans is another example of the violation of “economics in one lesson.” The waiver benefited one group at the expense of many others. The loan waiver is “seen” to benefit farmers but what is “unseen” is the sacrifice of the other groups that will be forced to pick up the bill for these waivers. The cost to taxpayers for the loan waivers in the five states so far is Rs. 96,000 crores which translates to about Rs.32,000 for each of the 3 crore tax payers in the country. What is unseen is what these taxpayers could have done with that extra money were they not forcibly required to pay off someone else’s loan. Maybe they would have paid off their own debt, or bought books for their kids, or paid for their health checkups, or taken a well-earned family vacation to see the grandparents, or bought a new computer to make the family more productive. Since these effects are unseen, policy makers choose to ignore them. But they are more important than the effects that can be seen. The art of good economic policy making, therefore, is to value that which is unseen more than that which is seen. Mr.Modi, I understand your obsession with visual theatrics–Swachh Bharat with celebrities holding brooms is one example–and so there will always be an inherent bias towards crafting policies with high visual appeal. This, unfortunately, is a serious risk India faces under your leadership–a penchant for policies that have good visual effects and focus on the “ seen,” but in reality extract huge “ unseen” costs. Focusing on the unseen can also debunk two big myths about the importance of state participation in economic activity. Every government believes that it needs to create jobs to help the economy. But this is a myth because it is productive activity and not jobs that creates wealth. Jobs are a second order effect. If there is production in an economy, jobs will be created as a result. The focus, therefore, should be on creating productive opportunities and jobs will follow as a result. The jobs created by the government are seen, and so the myth that government involvement is required to create jobs and reduce unemployment. But what is unseen is where the money to pay for these jobs comes from and the opportunity cost of that capital. Government jobs are financed from taxes paid by the private sector. The more jobs created by the government, the more money required to pay for these jobs, and higher the tax burden on the private sector. Unseen in the ‘government creates jobs’ myth, are the jobs that the private sector would have created had they been able to invest their money as they wished instead of having to pay it in taxes. Studies show that for every one job created by the government, three jobs are destroyed in the private market. Take the Indian Railways as an example. It is the sixth largest employer in the world. But a vast majority of these jobs are unproductive–a peon sitting outside an officer’s door all day adds no wealth to society. But these jobs are “seen.” What is unseen, however, are the productive jobs that would have been created, and the number of new widgets that would have been produced had these businesses not been forced to pay the taxes that go to paying the peon’s salary. The government does not create jobs. It simply replaces jobs that would have served the needs of consumers with jobs that serve the needs of the politicians and the bureaucracy. Another fallacy that pervades your government’s thinking, especially that of your Finance Minister, is that government spending is necessary for economic growth. Remember that every rupee that the government spends comes from taxes, borrowing, or printing new money. 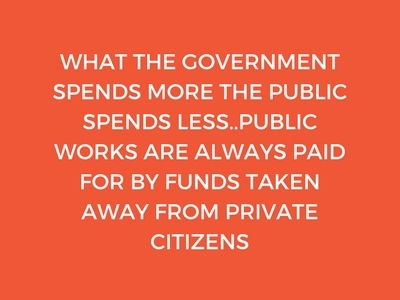 In other words, the money the government spends comes either from the current capital of the private sector, or from the capital stock of future generations, or from debasing the wealth of its citizens. The money spent by the government is the “seen” but what is unseen is the wealth that would have been created had these businesses and taxpayers been free to spend and invest their money in activities that they considered productive. The bottom line is that the Government cannot create wealth–it can only redistribute and destroy wealth. What policies would truly transform India? I am not talking about changing things at the margin. There has been enough marginal and incremental change in India over the last 70 years. Marginal change brings only marginal results. What is required is a radical change in the way India is governed, and Mr. Modi, you being a popular leader have the opportunity to truly transform India. A government is not an entity with an agenda of its own. It’s only purpose is to look after and promote the interests of the people it represents. What kind of government would best deliver the goods? The ideal government needs to be big in some places like equal justice and protecting our lives and rights, small in other places like regulating and nonexistent in others like commerce and business. When Thomas Jefferson said that ‘‘the government that governs least governs best,’’ he wasn’t talking about a government that doesn’t govern at all. He was asking a more fundamental question about what the state should be doing and what it should be leaving alone. 3) Providing public goods that benefit all but which are not profitable for individuals to provide on their own, and to collect revenues to pay for these public goods. a modern educational system that focuses not just on schooling but on knowledge and skill development. The problem with every Indian government, including yours, has been that it tries to do things it has no business being involved in and in the process ignores things that it should be doing. Instead of focusing on protecting its citizens and providing essential public services that all citizens consume ( public infrastructure, uninterrupted electric and water supply, a clean environment which includes clean air and water, good sanitation, and cultural and sports facilities to augment the quality of life), your government is busy trying to run banks, airlines, steel, energy, transportation and fertilizer companies. In addition, your government has now taken on the added responsibility of taking care of India’s cattle which would leave it with even less time to protect the life, property, and rights of all the citizens.